At CeMAT, which will be held in Hanover from May 19 to 23, the Beumer Group will be presenting a number of new solutions, including a belt tray sorter equipped with new modules and functions, a more efficient drive system with significantly increased efficiency and a completely redesigned machine in the Beumer stretch hood series. These tailor-made solutions by the intralogistics specialists are a response to changing consumption patterns and to e-commerce, a major driver of growth. Visitors to the trade show will be able to see the 40-meter-long BS 7 BT belt tray sorter in action. Beumer has equipped the machine with a variety of modules and functions, thus demonstrating how it can accommodate users’ individual requirements. An example is the manual input station, which provides a low-cost means of loading items onto the sorter. Another module consists of a camera system that reads barcodes on products right when they are loaded. If the system cannot recognize the barcode, it does not feed the product. There is also a tool which corrects errors in the sorting process, in this way improving accuracy. A correcting frame detects the position of the product on the belt tray element. 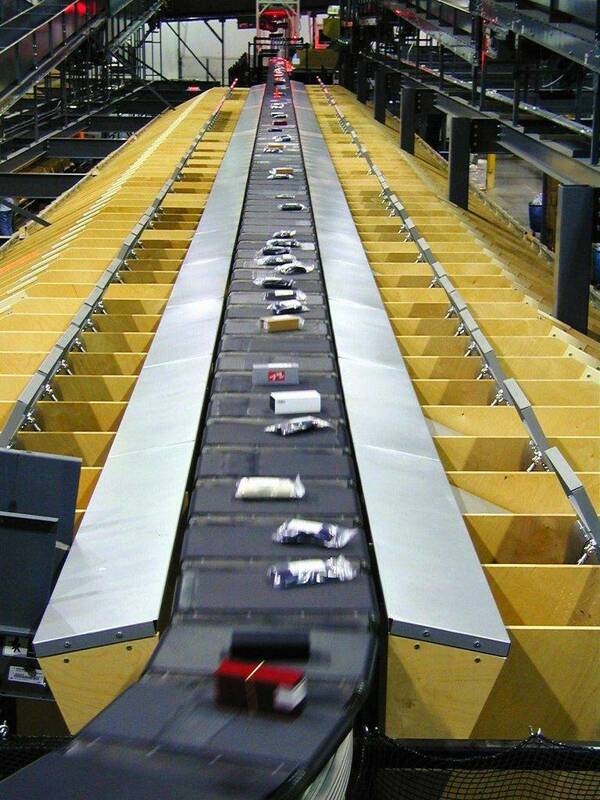 If the item is too far to the left or right on the belt, the system pushes it back to the middle, ensuring a secure and reliable sorting process at all times. Beumer and the Danish company Crisplant a/s, another member of the Beumer Group, are among the world’s leading suppliers of sorting and distribution equipment. At its trade fair booth Beumer will be showcasing its comprehensive expertise, including fully automatic sortation systems such as the Double-Density Tilt-Tray Sorter and the Crisplant LS-4000 High-Speed Loop Sorter. These are used throughout the world in postal and distribution centers and enable goods to be sorted quickly and gently. The cross-belt and tilt-tray sorters provide a high level of benefit for the user. In the area of high-performance sorters the Beumer Group has developed the new OptiDrive, an efficient force-fit drive system which offers an extremely economical alternative to conventional asynchronous linear motors. Its special feature is what is called double-acting proportional contact pressure. Pressure is applied in both directions – in accelerating as well as in braking. In this way the pressing force of the drive wheel is automatically adjusted depending on the amount of power needed. This increases efficiency by as much as 85 percent and extends the service life of the drive wheels. The system is already in successful operation. From filling to packaging – The strength of the Beumer Group is its ability to combine individual machines and systems by means of intelligent automation for greater efficiency. The Beumer Group supplies filling, palletizing and packaging equipment from a single source. The Beumer fillpac, for example, can be incorporated flexibly into existing packaging lines. The bagging machine is equipped with a calibratable weigher. The electronic weighing unit ensures that the fillpac always achieves accurate filling quantities. Special software enables the weigher to communicate continuously with the filling spouts. This enables users to get the best out of their packaging lines, as it is not necessary to reject bags with incorrect weights from the process. Beumer has completely revamped the Beumer paletpac high-performance layer palletizer in order to stack paper, PE and PP bags on different sized pallets flexibly, accurately and stably, and now even more efficiently. Users benefit from improved accessibility, shorter installation time, greater flexibility and therefore lower costs. The palletizer can be fitted with a rotary clamp or double belt turning device which allows bags filled with bulk materials with special flow behavior to be stacked on pallets gently, quickly and accurately. Beumer’s Customer Support specialists can easily retrofit existing palletizers with this solution. Beumer also offers the robotpac, a space-saving, fully automatic articulated robot which is able to perform complex palletizing and depalletizing tasks reliably and efficiently. Containers such as bags, cartons, boxes, canisters and trays can be stacked safely and economically. Beumer has developed appropriate, flexibly exchangeable gripper systems for every packaged product. Beumer has added a new machine to its stretch hood series for efficient packaging of palletized stacks. As part of this work, it redesigned its high-performance packaging system from the bottom up. Beumer’s experts analyzed different components and optimized them. For example, they improved the menu guidance for the control of the machine via a soft touch panel, redesigned the workstations according to ergonomic principles and equipped the machine with an innovative system which transports the film with the utmost care. In the field of conveying and loading equipment Beumerprovides information on belt conveyor systems with horizontal and vertical curves, belt bucket elevators, heavy-duty belt bucket elevators for particularly large delivery rates and heights, and steel cell conveyors fitted with chains or belts for clinker. As well as supplying all the machines and electrical equipment, Beumer usually takes charge of the whole process. This includes the process design for the complete system as well as the coordination and monitoring of installation and commissioning. Visitors to the trade fair will also learn about Beumer Customer Support, which ensures that all of the user’s systems have a high level of availability and optimizes existing machinery with the latest software updates. The support experts, who are located all over the world, provide professional repair and maintenance, deliver spare parts and carry out customer training. will be in touch as soon as possible. Accuweigh Weighbridge Uses Avery Stainless Steel Load Cells for Cheetham Salt.